Like most things, anything that Apple tends to do will most likely get replicated. Since the creation of the iPhone X there has been a significant increase in phones that have the notch. To cut a long story short, no one apart from Apple has a reason for it. Why did Apple put the notch in the first place? In 2017 Apple released their most rumoured device after iPhone 8 – the iPhone X. Unlike previous devices, this phone had a peculiar display. Rather than having a full screen it had something which was later on described as the notch. But the notch has it’s purpose. Unlike all the imitators ( LG G7, HUAWEI P20 range, One plus 6 etc.) the notch is the home of 3D technology. Only the iPhone X gives its users the ability to unlock their phones with their face. In order to unlock your phone with your face, your face needs to be scanned. This is where the Face ID comes in. Similar to the fingerprint scanner Apple’s Face ID compares two facial images and compares both images to see how similar they are. With a combo of light projectors and sensors ( see the above image) of your facial features Apples ” TrueDepth camera system” works in tandem to create a detailed facial map of the user. The technology behind uses a combo of light projectors and sensors to take pictures of your face — more specifically, facial features. To enable Face ID, Apple uses its TrueDepth camera system: the two technologies work together to create a detailed map of the user’s face. To get an accurate reading the notch was created so nothing gets in the way. Pretty cool right? Yet, manufacturers from across the globe have copied the design but not it’s purpose. Not all the imitators are stuck with the unnecessary notch. 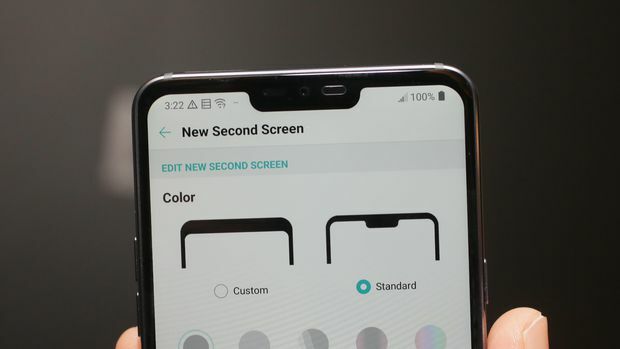 Unlike the rest, the LG G7 gives its users the chance to either change the colour of the top part of the screen where the notch is or remove the notch entirely. But apart from that, it’s pointless. Apple’s design inspiration isn’t over. To compete with Apple their will always be some design that may be replicated ( Sony and Nokia have followed Apple’s footsteps by removing the headphone jack ). True innovation is yet to come, but the wait may not be as long as we think.